08.13.2010, Uncategorized, by Jack W Perry. I am not a superstitious person. I do believe in fate, karma and luck though. But I believe each person can control and create one’s path. I am not a fan of people just throwing up their arms and saying it “isn’t my fault’, it must be xxxxxxx. That just seems like an excuse. Sure some of the time you can’t change the outcome. But you do have an influence. People create good karma. People make their own luck. People control more than they believe. Friday the 13th. I started to research the origins and such of this phobia. But quickly got tired of it. I just am not interested in how it got started but that some people get paralyzed by it. The number 13 just seems to freak out many people. I used to travel a lot. My schedule would change at a moment’s notice and I would have to make new reservations. I ended up in a lot of ROW 13 seats on planes because I would fly stand-by. It’s funny, even people who are not afraid of 13, probably would not select that row number on a plane. Many hotels don’t even have a 13th floor. But I have also found that if they do, it is usually the last to fill up. 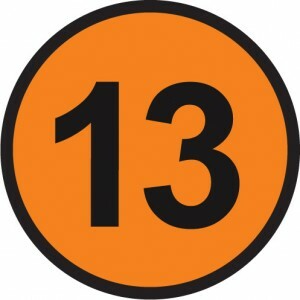 Triskaidekaphobia is the fear of the number 13. Many years ago, I was on a flight out of Atlanta. It was on Eastern Airlines. Eastern is long gone and this was near the end of their existence. It was Friday the 13th. I was in row 13. The weather was horrible and lightening lit up the skies. I was reading my USA TODAY and came across an article about the problems Eastern was having with their mechanics and that many safety rules were being overlooked. Basically there was not enough people to do all the checks required and keep the planes running on schedule. As I was reading the piece, BOOM, the plane was hit by lightening and we dropped a few thousand feet. I remember clearly being a few inches above my seat. My stomach was in my throat. Passengers were screaming. Probably the scariest flight I have ever been on. But we made it OK and landed safely. I figure if I made it through that, then the number 13 would be OK with me.